1940 - Nove mber 27 - San Francisco- In the The Year of the Dragon between 6:00 a.m. and 8:00 a.m. (the hour of the dragon), Lee Jun Fan, Bruce Lee is born at the Jackson Street Hospital in San Francisco Chinatown while his father and mother traveled to the U.S. Lee Hoi Chuen, Bruce's father, was performing with the Cantonese Opera Company in America. At three months old, Bruce debuts in "Golden Gate Girl" in San Francisco, CA. He plays role of a female baby, carried by his father. 1941 (Age 1): Hong Kong - Bruce and his parents return to Kowloon, their family home. They move to into an apartment at 218 Nathan Road, Kowloon district. The apartment is located on the second story of a building which contained a store on the ground level. 1952 (Age 12): Hong Kong - Bruce begins attending La Salle College. 1953 (Age 13): Hong Kong - After being beaten up by a street gang, Bruce begins to take Kung-Fu lessons, despite local Hong Kong laws, outlawing street fights. This is the first, and the last time Bruce looses a fight. He begins to train under Sifu Yip Man, a master of the wing chun system of Kung-Fu. 1954 (Age 14): Hong Kong - Bruce takes up cha-cha dancing. 1958 (Age 18): Hong Kong - Bruce wins the Crown Colony Cha-Cha Championship. Bruce has a leading role in the film The Orphan. This is the last movie Bruce makes as a child actor. This is the only movie where Bruce does not fight. 1958 (Age 18): ??? - Bruce enters the 1958 Boxing Championships and defeats the reigning three year champion, Gary Elms. 1959 (Age 19): Hong Kong - Because of numerous street fighting, causing police involvement, Bruce's father and mother decide that Bruce should take a three week voyage to the United States. The trip is a possible means to get him back on the right track. He return to his birth-place -- San Francisco Chinatown. Time was also running out for him to claim his American Citizenship. 1959 (Age 19): San Francisco - Seattle - With $15 from his father, and $100 from his mother, Bruce arrives in the United States, living with an old friend of his father. He works odd jobs around the various Chinese communities. Later, he moves to Seattle to work for Ruby Chow, another friend of his father. He lives in a room above her restaurant while working as a waiter downstairs. He eventually enrolls in Edison Technical School and earns his high school diploma. Bruce begins to teach his Martial Art skills in backyards and city parks. 1961 - March (Age 21): Seattle- Bruce enrolls at the University of Washington, studying Philosophy. He teaches Kung-Fu to students at school. 1963 - Summer (Age 23): Hong Kong - Bruce proposes to Amy Sanbo but is turned down. Bruce returns to Hong Kong with friend Doug Palmer for the first time since his arrival in the U.S. to visit family. He then returns to Seattle at the end of summer to continue his education. 1963 - October 25 (Age 23): Seattle - Bruce takes out Linda Emery (his future wife) for their first date. They have dinner at the Space Needle. Bruce gives notice to Ruby Chow and leaves her restaurant. He starts the first Jun Fan Kung-Fu Institute. At Garfield High School, Bruce demonstrates the "One-Inch Punch". This is the punch he would later make famous at the 64' Long Beach Internationals and which was developed by him and James DeMile in Seattle. Bruce would hold his arm straight out, and with a shrug of his shoulder, knock a man straight across the ground. 1964 - June (Age 24): ??? - Bruce discusses with James Yimm Lee plans to open a second Jun Fan Kung-Fu Institute in Oakland, CA. 1964 - Summer - Oakland (Age 24): Plans are finalized, and Bruce leaves Seattle to start a second Jun Fan Kung-Fu school in Oakland. His good friend, Taky Kimura, takes over as head instructor. 1964 - August 2 (Age 24): Long Beach, CA - Ed Parker, known as the Father of American Karate (Kenpo), invites Bruce to give a demonstration. Bruce shows off his "one-inch punch," and his two-finger push-ups, where he literally does "two" finger push-ups. At his first International Karate Championships, Jay Sebring, the hair stylist for Batman, William dozier, a producer, who is looking to cast a part in a TV series he was developing. Sebring then gives a film of Bruce's demo to Dozier who is impressed at Bruce's super-human abilities. Bruce later flies down to Los Angeles for a screen test. 1964 - August 4 (Age 24): Oakland - Bruce leaves for Seattle. He will propose to Linda. 1964 - August 17 (Age 24): Seattle - Bruce returns to Seattle to marry Linda. They soon move to Oakland. 1965 (Age 24): Oakland - Several months after he begins teaching, he is challenged by, Wong Jack Man, a leading Kung-Fu practitioner in the Chinatown Community. They agree: If Bruce looses, he will, either close his school, or stop teaching Caucasians; and if Jack looses, he will stop teaching. Jack Man Wong does not believe Bruce would actually fight, and tries to delay the match. Bruce becomes angered and insists that they not wait. Wong then tries to put limitations on techniques. Bruce refuses "rules" and the two go no holds barred. Bruce begins to pound his opponent in only a couple of seconds. As Bruce is winning, Wong attempts to flee, but is caught by Bruce. Bruce begins to beat him on the ground. Students of the other teacher attempted to step in and help their teacher, James Lee, Bruce's good friend prevent this. Later he is bothered on why the fight took so long and begins to re-evaluate his style. He is determined that he is not in his top physical condition. Thus, the early concepts of Jeet Kune Do (JKD), "The art of the intercepting fist" is created. JKD is an art including techniques of all types of fighting. (i.e. American Boxing, Thai Kick Boxing, Japanese Karate, etc.) His style is no style. Bruce is signed to a one-year option for The Green Hornet. He is paid an $1800 retainer. 1965 - February 1 (Age 25): Oakland, CA - Brandon Bruce Lee is born. 1965 - February 8 (Age 25): Hong Kong - Bruce's father passes away in Hong Kong. Bruce returns to Hong Kong for his fathers funeral. As tradition dictates, in order to obtain forgiveness for not being present when his father died, Bruce crawls on his knees across the floor of the funeral home towards the casket wailing loudly and crying. 1965 - May (Age 25): ??? Bruce uses the retainer money from the Green Hornet and flies himself, Linda, and Brandon back to Hong Kong in order to settle his father's estate affairs. While in Hong Kong, Bruce takes Brandon to see Yip Man to persuade Yip to perform on tape. Bruce wants to take the footage back to Seattle and show his students what the man looks like in action. Yip modestly declines. 1965 - September (Age 25): Seattle - Bruce, Linda, Brandon return to Seattle. third branch of the Jun Fan Kung-Fu Institute in Los Angeles' Chinatown. 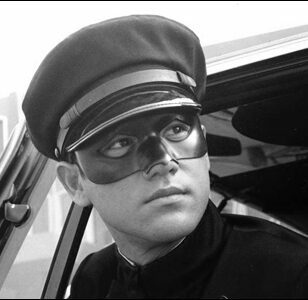 1966 - September 9 (Age 26): Los Angeles - The Green Hornet series premiers. 1967-1971 (Age 27-31): Hollywood - During this time, Bruce lands bit parts in various films and T.V. series. He also gives private lessons for up to $250 an hour to personalities Steve McQueen, James Coburn, James Garner, Lee Marvin, Roman Polanski, and Kareem Abdul Jabbar. Bruce meets Chuck Norris in New York at the All American Karate Championships in Washington D.C. Chuck fights Joe Lewis and wins. 1967 (Age 27): Washington, D.C. - Bruce meets Joe Lewis at The Mayflower Hotel while both were guests at the 67' National Karate Championships. Joe is competing in the tournament and Bruce is making special appearances as Kato. 1967 - February (Age 27): Los Angeles - Bruce opens a 3rd school at 628 College Street, Los Angeles, CA. Dan Inosanto serves as assistant instructor. 1967 - July 14 (Age 27): Los Angeles - The last episode of The Green Hornet Series shows. The movie is later said to have failed because Bruce, a minor role became more popular than the main character. 1969 - April 19 (Age 29): Santa Monica, CA Shannon Lee is born. 1969 (Age 29): ??? - A scriptwriter is hired and paid $12K by Stirling Silliphant and James Coburn to write a script for the Silent Flute. The script produced is unacceptable, and no other scriptwriter could seen to do the job. They then decide to write it themselves. 1970 (Age 30): Los Angeles - Bruce injures his sacral nerve and experiences severe muscle spasms in his back while training. Doctors told him that he would never kick again. During the months of recovery he starts to document his training methods and his philosophy of Jeet Kune Do. 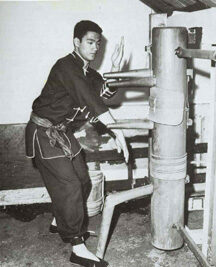 Later after his death, The Tao of Jeet Kune Do is published by his wife in memory of Bruce Lee. 1970 (Age 30): Hong Kong - Bruce and Brandon fly to Hong Kong and are welcomed by fans of The Green Hornet Show. Bruce sends Unicorn to talk to Run Run Shaw on his behalf and inform Shaw that he would be willing to do a movie for him for $10K. Shaw makes counter-offer of a seven year contract and $2K per film which Bruce declines. 1971 (Age 31): Hong Kong. - Bruce takes a short trip back to Hong Kong to arrange for his mother to live in the U.S. Unknowingly to him, he had become a superstar for The Green Hornet was one of the most popular TV shows in Hong Kong. Later, he is approached by Raymond Chow, owner of a new production company, and offered the lead role in a new film called The Big Boss. Bruce accepts. Bruce is supplied with small furnished apartment at 2 Man Wan Road - Kowloon, HK. Wu Ngan, moves in with Bruce and Linda. Later Wu Ngan marries and his new wife moves in as well. Brandon attends La Salle College. The same school Bruce attended only 15 years before. Bruce is interviewed by Canadian talk show host, Pierre Berton, for a TV program being filmed in Hong Kong. This is the only on film said to be in existence. 1971- Ju ly (Age 31): Thailand - Filming begins for The Big Boss (releaseed in the U.S. as Fists of Fury). The Big Boss opens in Hong Kong to great reviews and mobs of fans. Proceeds to gross more than $3.5 million in little than three weeks. 1972 (Age 32): Hong Kong - Fist of Fury (released in the U.S. as The Chinese Connection) is released. It grosses more than Th e Big Boss and further establishes Bruce as a Hong Kong superstar. Bruce gets a larger budget, a larger salary, and more power of directing in this film. Bruce begins work on Game of Death and films several fight scenes including Danny Inosanto and Kareem Abdul-Jabbar. Bruce appears on Hong Kong's TVB cha nnel for a hurricane disaster relief benefit. In a demo Bruce performs, he breaks 4 out of 5 boards, one of which is hanging in the air with a line of string. Brandon even performs and breaks a board with a sidekick! Bruce helps Unicorn, a fellow actor, by assisting him for one day and supervises fight action sequences in Unicorn's film, The Unicorn Palm - Footage of Bruce on the set is used in the movie and Bruce's name appears in the credits to his surprise causing Bruce to become angry and make a public announcement denying his endorsement of the film. Unicorn was advised to get Bruce's name in the credits, so his movie would have a better chance at being a success. 1972 (Age 32): Rome, Italy - Location shots are made for Bruce's third film The Way of the Dragon (released in the U.S. as The Return of the Dragon). This time Bruce gets almost complete control the the movie, which he writes, directs, and stars in. Chuck Norris is Bruce's adversary in the final fight scene. Again, this film surpasses all records set by his previous two films. 1973 - February (Age 33): Hong Kong - Bruce gets his chance at American stardom as filming of Enter the Dragon begins while Game of Death is put on hold. It is the first-ever production between the U.S. and Hong Kong film industries. On February 20, Bruce is guest of honor at St. Francis Xavier's school for Sports Day ceremonies. 1973 (Age 33): Los Angeles - Grace Lee, Bruce's mother, sees Bruce in Los Angeles, CA. Bruce tells her that he does not expect to live much longer and that she is not to worry about finances as he will make sure she is provided for. She rebukes him for talking that way. 1973 - A pril (Age 33): Hong Kong - Filming of Enter the Dragon is completed. Bruce is at Golden Harvest Studios in Hong Kong dubbing his voice for "Enter The Dragon". The air conditioners had been turned off, so the microphones won't pick them up. The temperature soared. Bruce takes a break looping lines to go to the bathroom and splash water on his face. In the bathroom, he passes out on the bathroom floor. He revives twenty minutes later just as assistant sent to find out what was keeping him walks in and discovers him on the ground. He tries to conceal his collapse by acting as though he has dropped his glasses on the floor and is searching for them and is helped up by the assistant. As they are walking back to the dubbing room, Bruce collapses again and is rushed to a nearby hospital. 1973 - July 10 (Age 33): Hong Kong - Bruce Lee is walking through the Golden Harvest Studios and overhears Lo Wei in a nearby room bad mouthing him. He confronts Lo Wei who retreats and summons the local police. When the police arrive Lo Wei falsely accuses Bruce of threatened him with a knife concealed in his belt buckle. He further insists that Bruce sign a statement that he will not harm him. Bruce signs the statement to get Lo Wei off his back although Lo Wei lied to the police and Bruce never had a knife nor threatened to kill him. That same day, Bruce appears on the Hong Kong TV show, Enjoy Yourself Tonight with host Ho Sho Shin. Bruce alludes to his problems with director Lo Wei, but does not mention him by name. Bruce is asked to display his physical prowess and demonstrates his abilities. Bruce demonstrates a technique and Shin is hurled across the stage. The show of power causes the press to indite Bruce in the paper and accuse him of bullying the talk show host though this was not the case. 1973 - July 16 (Age 33): Hong Kong - Heavy rains fall caused by a typhoon off the coast of Hong Kong. Bruce makes a $200 phone call to speak to Unicorn in his hotel room, who is filming a movie in Manila. Bruce tells Unicorn that he is worried about the many headaches he is experiencing. 1973 - July 18 (Age 33): Hong Kong - A bad Feng Shui deflector, placed on the roof of Bruce's Cumberland Road home in Hong Kong is blown off the roof by heavy rain and winds. The deflector had been placed on the house to protect Bruce and family from bad Feng Shui; previous owners had all been plagued by financial disaster and it was believed that this was because of the incorrect positioning of the house. The deflector was to ward off evil spirits. 1973 - July 20 (Age 33): Hong Kong - Early in the morning Bruce types a letter to his attorney, Adrian Marshall, detailing business ventures he wants to discuss on his upcoming trip to Los Angeles. Bruce had tickets already set to return to the US for a publicity tour and was scheduled to appear on the Johnny Carson show. Raymond Chow goes by Bruce's house and the two discuss plans for their upcoming movie Game of Death. Linda kisses Bruce good-bye and says she is going out to run some errands and will see him later that night. Raymond and Bruce visit Betty Ting Pei at her apartment to discuss her role in Game of Death. That evening plans had been made for them all to meet George Lazenby over dinner and enlist him for a part. Bruce explains that he has a headache, takes a prescription pain killer offered by Betty, and lies down on her bed to rest prior to dinner. Raymond Chow departs and says that he will meet them later. Raymond Chow and George Lazenby meet at a restaurant and await Bruce and Betty's arrival, but the two never show up. At 9:00 p.m. Chow receives a call from Betty; she said that she has tried to wake Bruce up but he won't come to. Betty summons her personal physician who fails to revive Bruce and who has Bruce taken to the hospital. Bruce does not revive and is pronounced dead. The doctor's are surprised that he had lasted as long as he did that night but unfortunately Betty did not get him help as soon as she could have. Bruce Lee dies in Hong Kong of an apparent cerebral edema (swelling of the brain). After much confusion and debate, doctors declared the death of Bruce Lee as "death by misadventure." Enter the Dragon was delayed from its initial premieres by four day because of the actors death. 1973 - July 25 (Age 33): Hong Kong - A funeral ceremony is held for friends and fans in Hong Kong consisting of over 25,000 people. Bruce is dressed in the Chinese outfit he wore in Enter the Dragon. 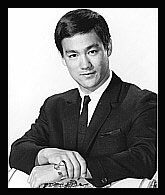 1973 - July 30 (Age 33): Seattle - After a smaller second ceremony in Seattle, Washington at Butterworth Funeral Home on East Pine Street, Bruce Lee is buried at Lake View Cemetery. His pallbearers included Steve McQueen, James Coburn, Danny Inosanto, Taky Kimura, Peter Chin, and his brother, Robert Lee. 1973 - August 24 Hollywood - Enter The Dragon premiers at Graumann's Chinese Theater. The movie is a success, and Bruce Lee achieves world-wide fame. I, Bruce Lee, will be the first highest paid Oriental super star in the United States. In return I will give the most exciting performances and render the best of quality in the capacity of an actor. Starting 1970 I will achieve world fame and from then onward till the end of 1980 I will have in my possession $10,000,000. I will live the way I please and achieve inner harmony and happiness.